Ogre was the object of most of SJ Games' efforts in 2013 (seriously . . . would you stand in an Ogre's way? ), so other lines -- like GURPS -- went on the back burner. Or did they? In point of fact, GURPS saw a respectable amount of action last year. 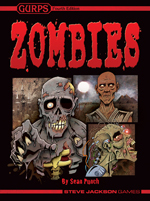 The Big, Shiny GURPS release of 2013 was GURPS Zombies. We published this 160-page sourcebook in both hardback and PDF form. As its author, I am of course inordinately proud of it -- in the spirit of zombie-makers everywhere, I'd consider it one of my finest creations -- but only because I truly believe that any gamer with an interest in zombies will find it valuable. In addition, we managed to publish two new volumes in the GURPS Martial Arts series: Technical Grappling, for fans of detailed strangling and limb-twisting, and Yrth Fighting Styles, for gamers who like fantasy warriors with more depth than "I hit it with my axe!" 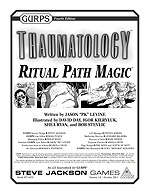 GURPS Thaumatology likewise got a double shot of support, in the form of the flexible ritualism of Ritual Path Magic and the structured internal mysticism of Chinese Elemental Powers. Other e23 originals were GURPS Locations: St. George's Cathedral and GURPS Underground Adventures, which describe good places to hide zombies, have fights, and work magic in peace; and GURPS Loadouts: Low-Tech Armor, which offers proper safety gear for all this action . . . namely, suits of armor. 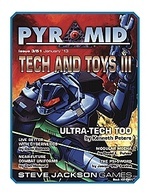 Throughout all this, Pyramid provided dependable support. The 2013 lineup consisted of issues #3/51: Tech and Toys III, #3/52: Low-Tech II, #3/53: Action, #3/54: Social Engineering, #3/55: Military Sci-Fi, #3/56: Prehistory, #3/57: Gunplay, #3/58: Urban Fantasy II, #3/59: Conspiracies, #3/60: Dungeon Fantasy III, #3/61: Way of the Warrior, and #3/62: Transhuman Space II. We also kept whittling away at our GURPS Classic obligations in the form of Magic Items 3, Monsters, Psionics, Robots, Spirits, Traveller: Alien Races 4, Traveller: Far Trader, and Vehicles Expansion 1 and 2. The Ogre roadblock didn't slow down work behind the scenes, either. Projected 2014 releases that saw significant progress in 2013 were the second edition of the Discworld Roleplaying Game, a GURPS Dungeon Fantasy item, GURPS High-Tech: Adventure Guns, GURPS Horror: The Madness Dossier, two GURPS Power-Ups volumes, something for the GURPS Social Engineering series, yet another GURPS Thaumatology supplement, and Transhuman Space: Wings of the Rising Sun. As well, we forged ahead on seven or eight projects I'm not cleared to mention. Add in the new ground we'll break in 2014 and it should be a good year!